Sometimes a very simple set up will make a huge difference to your cats. I bring in a few plants from the garden every fall for them. They have a few favourites. 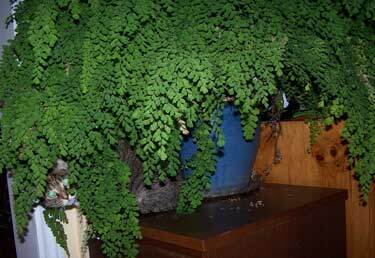 The maidenhead fern makes a wonderful canopy they can hide under. I also have a spider plant that gets rave review. 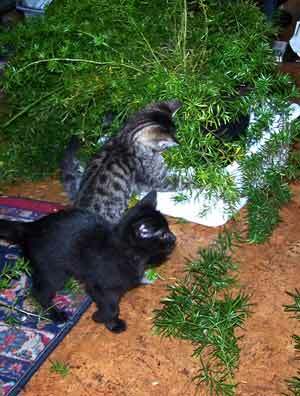 The cats don't eat the fern but love to sample the spider plant. 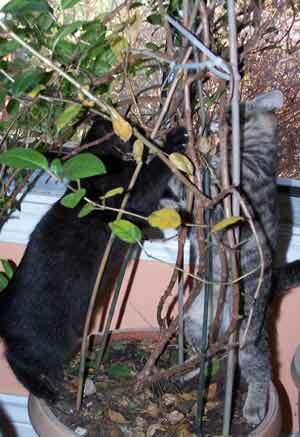 My cats like little hiding spots and rustling leaves. It is now Fall and most of the garden has died out. The weather is not so good and it often rains. Cat activity has moved inside and I've set up a few cat spots. The big fern comes in every fall. All the cats love the fern cave. There is enough space to quietly sit and ambush any passing friend. They all like to chew it but never eat any. They seem to lick it and rub their faces in the stems and leaves. It makes a nice rustling noise and they can push their noses through. The ferns sits on a large plastic plate that I keep filled with water. 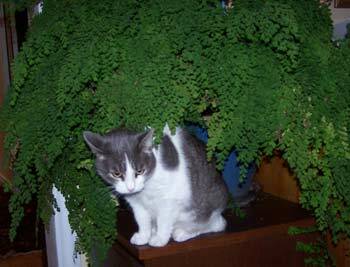 The fern doesn't seem to mind and all the cats like to drink the water. They have fresh clean water in their bowl, the fern water is better. 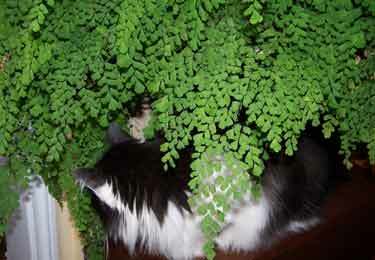 There is lots of room to stretch out and nap and there is often a cat snoozing in the fern cave. Gwen likes spider plants as do most cats. 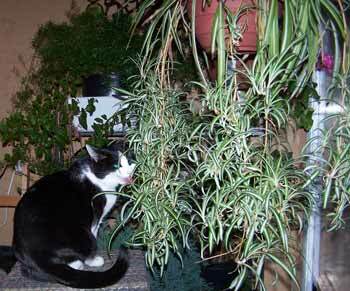 The Spider plants is one of the all time cat favourite house plants as far as eating goes. I often grow birdseed in a pot and they will nibble on it but go back to the spider plant. 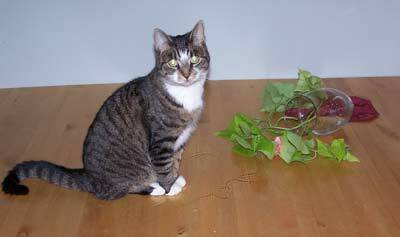 It's possible to bring in a plant of catnip but it doesn't live for very long. I think it needs better light than I can give it. The spider plant just keeps on going in just about any condition. Lulu is very clever (or bad) about spilling flowers. She found these and worked a long time to knock over the pot. I put the plants back in and she spilled them again, faster. Eventually she could do it in record time. I have a video of Lulu figuring out how to knock over the flower vase. 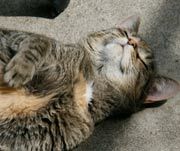 Most cats like cut flowers and will come and smell them and rub against them. If you use a heavy low pot then they don't spill easily. Lulu's vase had sweet potato vine. She really like the plant outside. Another favourite plant is celery and I sometimes put a few stems out for them to sniff and rub against. Not all plants are liked by my cats. They have no interest in geraniums and ignore the english ivy completely. Lulu likes bean seedlings so I occasionally throw a few seeds in the base of other plants. She finds them and eats them. Sweet potatoes can be planted in soil, or just put in water, and will grow a vine that some of my cats have enjoyed sniffing and eating.